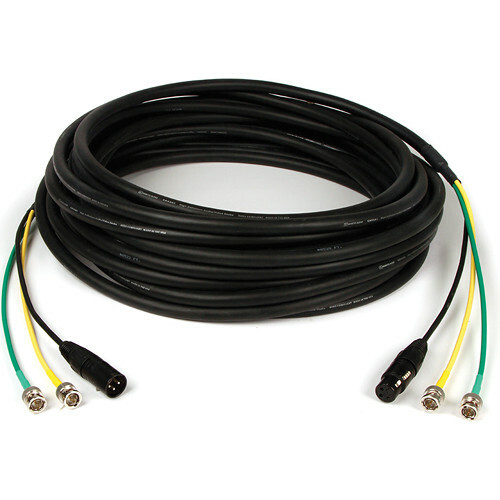 This 50 ft 2x HD-SDI & XLR AV Snake Cable from Remote Audio allows you to carry two HD-SDI video signals and an AES/EBU audio signal with minimal clutter and setup/tear down times. It was designed with video assist and DIT applications in mind. Each end features two BNC connectors and a 3-pin XLR connector on mini coaxial cables. All the BNC connectors are male, and the XLR connectors are male on one end and female on the other. The BNC pairs are color coded yellow and green. Box Dimensions (LxWxH) 10.7 x 10.4 x 2.4"
What is the outside diameter of this cable? The overall cable diameter is 0.487&rdquo; or 12mm.